From Ideas to Action John L. Ross, Jr.
"There needs to be a workshop that is built around this book... providing a logical approach to implantation within a business context. This workbook coupled with general knowledge training connects the dots." 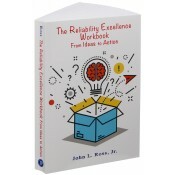 Reading this book is like having a seasoned reliability consultant sitting across the table, helping to drive your organization along a continuum of reliability improvement. The author introduces a concept, provides space for readers to record their experiences and observations, offers anecdotal and tried and tested examples and approaches, and drives readers to potential customizable solutions. clearly understand their current situation. plan a route to improvement and high performance. develop the path forward, including how to articulate a compelling case for change to their supervisors. With the combination of forms, tables, and discussions in this workbook along with readers' own vision, they will create a working strategy they can continually use to grow and improve their business. John L. Ross, Jr., Ph.D., CMRP , is a seasoned practitioner of maintenance and reliability with over three decades of field and plant experience. He is a former Captain and Gulf War Veteran with the United States Air Force. Dr. Ross is the President of the international reliability consulting company, Maintenance Innovators, Inc., and the sole proprietor of State Line Group, LLC. He proudly serves as a Senior Consultant with the widely renowned Marshall Institute.